I used to belong to a writing workshop in Philadelphia that was no joke. The instructor, James Rahn, played by standard workshop rules: no talking when your piece is be critiqued, ask questions after, be thoughtful, be honest, be kind, and never let a writer get away with anything false or lazy. The first night my work was up for critique was a gut punch like I’d never felt before. What was unique about this workshop was that the group was vetted by Rahn. He interviewed new applicants over the phone or in person, and not everyone interested would be allowed to participate. When I joined the group he’d been running the workshop for nearly twenty years. As a result he’d assembled an impressive group of studied and practiced local writers. Their observations were next-level insightful, and often beyond my understanding. I felt embarrassed. I felt like a fraud. After each session we’d walk from the Ethical Society of Philadelphia in Rittenhouse Square, where the class was held, to the Irish Pub on Walnut Street for a postmortem of the night, a few beers, and some food. Rahn is a product of Columbia University’s MFA program. He’s a writer formed in the Gordan Lish years, but most students wouldn’t know such information. He never touted his credentials as a justification for the program. As an instructor Rahn is smart, humorous, and strategic. Workshops were light in tone, but serious in content. His first novel, Bloodnight, was a tough look at boyhood life in 1970s Atlantic City. It showcased a unique combination of grit and levity in its prose. 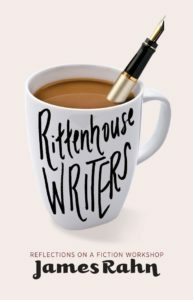 Rittenhouse Writers, a new book that combines Rahn’s personal reflection on his time leading the workshop with a collection of short stories produced therein, continues to mine stark juxtapositions to great effect. I was never keen on family. I didn’t like most of my own, couldn’t talk to or identify with almost any of them. Not a creative one in the bunch. And my early years mostly sucked. Make friends with your dark feelings and thoughts, so you can deploy them consciously and thus more skillfully in your writing. After the nieces arrived I considered taking off, becoming fugitive. For weeks I didn’t get any writing done. Rittenhouse Writers’ Group became a burden. Ultimately, the great success of Rahn’s book is his ability to show the correlation between the writing life and the life worthwhile. Students and teachers will find solace in these pages. The struggle to be an honest writer and an honest person is not easy, and Rahn explores this undertaking in a way that gives those obsessed with words and truth dignity. He shows what good and bad it has brought him, and what it can offer a writer. Tim Waldron is an Associate Prose Editor of The Literary Review.